An overwhelming sense of emptiness and loss continues in the gaping hole that was cleaved into the face of South Fork Dam 127 years ago. If you stand down in the middle, at the base of the dam where the earth gave way, there’s an overwhelming sense of emptiness and loss. That’s how it still feels deep in the gaping hole that was cleaved into the face of the South Fork Dam on the afternoon of May 31, 1889, when storm-swollen Lake Conemaugh burst through. 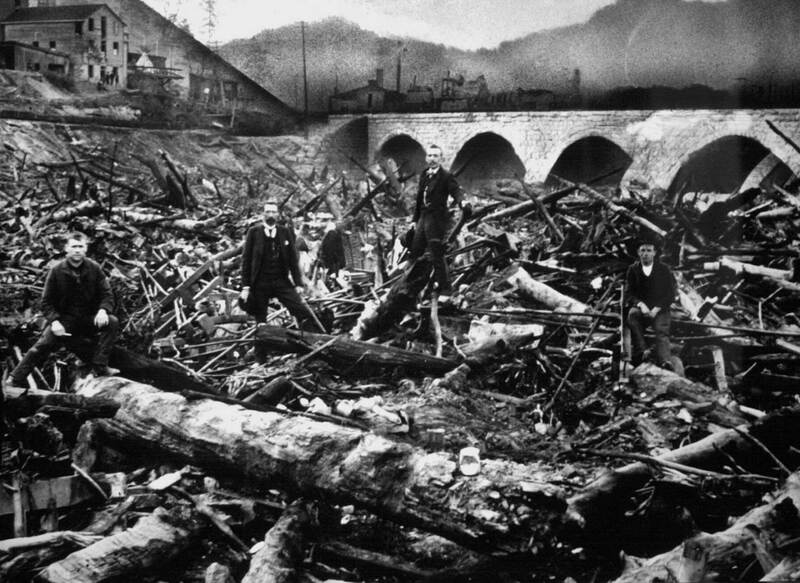 On that sodden Friday, in the narrow 14-mile long valley from here to Johnstown, 2,209 people died as a wave of water, moving with the force of Niagara Falls, flattened the towns of South Fork, Mineral Point, East Conemaugh, Woodvale and, finally, Johnstown. The flood, which washed away homes, businesses, churches, bridges, train cars and whole families, was the worst death toll disaster in U.S. history at the time. And It still ranks as the sixth worst, just behind the surprise Japanese air attack on the U.S. naval base at Pearl Harbor, on Dec. 7, 1941, where 2,467 died. From the wide picture windows of the Johnstown Flood National Memorial visitors center, just up the hill from the dam site, it’s easy to see the foreshortened ends of the stone and earth breastworks, still anchored to their hillsides and reaching out like arms that won’t ever embrace again. That’s because, 127 years later, there’s both nothing here for the dam to hold onto along the South Fork of the Conemaugh River. Visit the dam, wander through the exhibits, watch the visitors center movie, and come away with the sense that this disaster was both preventable and inevitable. Even with its rich trove of archival photos, its interactive map that charts the path of the wall of water bearing down on Johnstown, the coroner’s handwritten records that are both incomplete — about a third of the bodies were never identified — and provide too much grisly detail, this park service site is all about what’s not here anymore. The flood killed 2,209 people, including 99 entire families. One hundred twenty-four women lost their husbands; 198 men lost their wives; 396 children under the age of 10 died. It destroyed four square miles of Johnstown, including 1,600 homes and 280 businesses, and caused more than $17 million in property damage. So the dam is all but gone. Lake Conemaugh, the 2-mile-long, 450-acre recreational impoundment where club members boated and fished for black bass brought in from Lake Erie by the train load, is gone, leaving behind the empty bowl of a lakebed. The South Fork Fishing and Hunting Club, owner of the dam, is gone, disbanded and dissolved after the flood. Nicknamed “the Bosses Club” by locals, its 61 members comprised a who’s who of industrial titans, bank presidents, successful businessmen, well-heeled lawyers, politicians and other assorted Western Pennsylvania plutocrats. Among the names on the members roll were Andrew Carnegie, Henry Clay Frick, Andrew W. Mellon, Henry Phipps Jr., a steel company president and philanthropist; Pittsburgh department store owner Durbin Horne, and Sylvester Stephen Marvin, a cracker business mogul who would go on to establish the National Biscuit Company, also known as Nabisco. The group’s clubhouse, a rambling three-story frame structure in the Eastlake Style, with a gingerbread-encrusted wrap-around porch and room for 200 guests, still stands. But it’s more skeleton than showplace. The park service recently put on a new roof, interior supports and a coat of exterior paint. But the once well-appointed interior remains severely damaged, its fixtures gone and its walls wrecked down to exposed lath by time and neglect and, some might hope, shame. Where is the Woodwell painting? 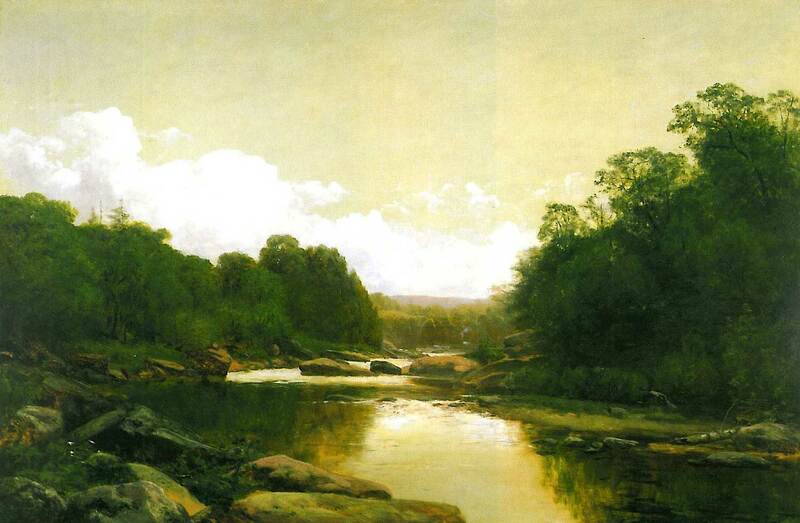 Gone, too, is one of the two paintings commissioned by the club in 1887, two years prior to the flood, from George Hetzel and Joseph Woodwell, artists who were members of the “Scalp Level School,” a loose cadre of Western Pennsylvania landscape painters led by Hetzel and named after the then-verdant valley 10 miles south of Johnstown where they often went to paint. Hetzel’s painting, titled “Fisherman on the Conemaugh,” hangs in the visitors center, and is representative of the realistic yet sublimely lit Scalp Level landscape style that bears similarities to the Hudson River school in New York and the Barbizon School in France. A painting titled “Fisherman on the Conemaugh,” 1887 by George Hetzel is on display at the Westmoreland County Museum of Art in Greensburg, PA.
Ms. O’Malley said that according to records of a 1904 auction of furniture and fixtures at the clubhouse, the Hetzel painting was bought by George Wertz, a then-prominent member of the Johnstown community, and donated to the park service by his great nephew, Roger Hager, in 2010. From Pittsburgh: Approximately 75 miles east, a 2-hour drive. The park visitor center is located just off PA Route 869, in the town of St Michael. Hours: The visitor center is open 9 a.m. to 5 p.m. seven days a week from mid-April to mid-November; winter hours: 9 a.m. to 5 p.m., Saturdays and Sundays only. Park grounds are open sunrise to sunset, seven days a week. For tours of the South Fork Fishing & Hunting Clubhouse, call visitor information or visit the NPS Web page. Admission: $5 per adult covers multiple visits on up to seven consecutive days. Cash/check only;. no credit cards. Children 15 and under, free. See the NPS website for discounts, fee free days. Accessibility: The visitor center, picnic area, first floor of the clubhouse and the top of the dam ruins on the south abutment are wheelchair accessible, as are bathrooms at the visitor center and picnic area. One wheelchair is available for loan free at the visitor center. The visitor center film is closed captioned. Other tips: Make sure to also visit the Johnstown Flood Museum, 304 Washington St., Johnstown, 15901, at the corner of Washington and Walnut streets. The museum was opened by the Johnstown Area Heritage Association in 1989 to mark the centennial of the flood, and contains numerous interesting artifacts, photographs and dioramas. Don’t miss the 26-minute film about the flood, which won an Oscar in 1989 for documentary short subjects. It’s shown every hour. Call 1-814-539-1889 for information on hours and rates or visit the Heritage Association web page. Did you know? : The disaster was the first test for the then-new American Red Cross and its director, Clara Barton, who arrived with 50 doctors and nurses five days after the flood. Where to eat: Back Door Cafe, 402 Chestnut St., Johnstown. Phone 1-814-539-5084 for hours and reservations (recommended). But there’s no such straight-line record for the painting by Woodwell, himself a South Fork club member, said Ms. O’Malley, who has been on a quest to find it since the Hetzel painting was acquired. She said there’s no record the Woodwell painting was sold at the 1904 auction, and no listing of it or its title in gallery records or newspaper stories from the time, or university art libraries. The only thing she knows for certain, from gallery records discovered in a library search, is that it was a painting of the rocky New England coastline, a frequent subject for Woodwell, who owned property along the coast at Magnolia, Mass. She’s even contacted the Woodwell family, but none of the dozen or so “Josephs” owned by various family members match up. Or it might be hiding in plain sight in the Westmoreland Museum of American Art, where Barbara Jones, the museum’s chief curator, oversees the largest known collection of paintings by Scalp Level artists. 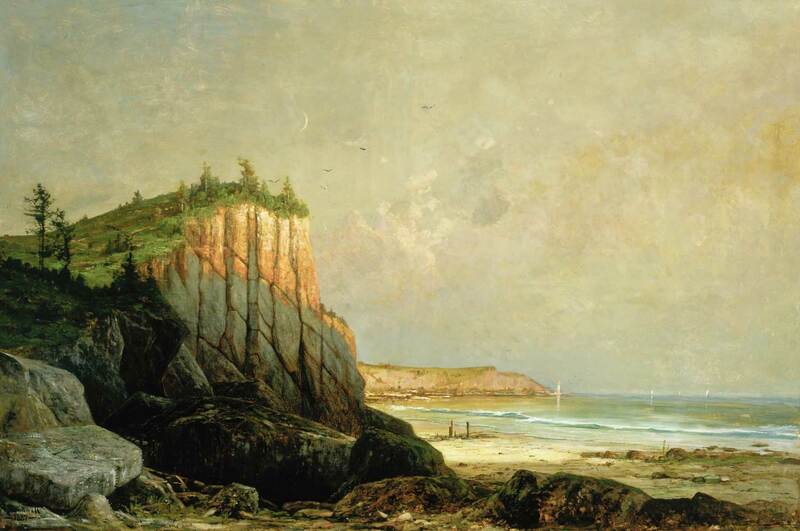 There, on a second floor gallery wall surrounded by six much smaller paintings by Woodwell is a large, 40-by-60-inch painting titled “Seascape, Magnolia, MA.,” featuring a tall, pink, sun-bleached cliff face in front of a wide beach. The painting is dated 1887. According to documents just discovered in the museum’s files detailing Joseph Woodwell’s life and paintings, the seascape painting was acquired in 1986 from John W. Kephart Sr., a Cambria County and Pennsylvania Supreme Court judge who lived in Ebensburg. Ms. Jones, the museum’s curator, thinks so, too. ”I believe, with the link to Kephart, that it sounds like the right painting, and the timing is right too. It’s exciting,” said Ms. Jones, adding that a loan of the painting is possible to the flood memorial’s visitor center, where it could be paired again with the Hetzel painting. Joseph Woodwell and his artist friends from Pittsburgh spent summers at Scalp Level in the 1870s and 1880s, gravitating to the area’s bucolic beauty and its sharp contrast to the metallic noise and industrial grit of their hometown. “Scalp Level was Western Pennsylvania’s answer to the Hudson River School,” Ms. Jones said in the museum’s gallery. It was part of the same philosophical trend, picturing nature at a time it was disappearing. But that green-leafed Scalp Level setting is gone now, too, transformed by the Berwind-White Coal Co.’s Eureka Mine 40. Once one of the largest in the state, it operated from 1905 to 1919, employing as many as 500 men and producing as much as 2,000 tons of coal a day. Today’s Scalp Level landscape is grayer, dominated by mountains of barren, erosion-creased coal waste discarded by the mine. In the shadow of those “bony piles” is the empty shell of the old two-story, red brick bathhouse, where the miners showered before climbing up the hill to their small coal patch homes. A lonely railroad track follows Paint Creek, now tinted by polluted mine drainage. Like a lot things at the flood memorial, the sun-spangled stream, lush woodlands and ethereal light captured on canvas by the artists, aren’t where they were before.